The Smithsonian’s National Air and Space Museum is one of the world’s most popular museums with more than 8.6 million visitors in 2017. Its mission is to commemorate, educate and inspire visitors by preserving and displaying aeronautical and spaceflight artifacts. The museum maintains the world’s largest collection of historic aircraft and spacecraft among more than 68,000 objects and serves the public through exhibitions, public programs, educational activities, publications and electronic outreach. It is also a vital center for historical research on aviation and spaceflight and related science and technology, and home to the Center for Earth and Planetary Studies, which performs original research and outreach activities in planetary sciences. The museum has two public display facilities. The flagship building on the National Mall in Washington, D.C., which opened in July 1976, houses many of the icons of flight, including the original 1903 Wright Flyer, Charles Lindbergh’s Spirit of St. Louis, Chuck Yeager’s Bell X-1, John Glenn’s Friendship 7 spacecraft and a lunar rock sample that visitors can touch. The museum’s Steven F. Udvar-Hazy Center, in Chantilly, Va., opened in December 2003 and houses many more artifacts in an open, hangar-like setting, including a Lockheed SR-71 Blackbird, a Concorde, the Boeing B-29 Superfortress Enola Gay, the Dash 80 prototype for the Boeing 707, the sole-surviving Boeing 307 Stratoliner and space shuttle Discovery. Aeronautics Department—The Aeronautics Department is responsible for research, collections, organization of exhibitions and public service relating to the history of flight in the atmosphere. Research efforts encompass the technological, military, political, economic, social and material culture aspects of human flight. Research is disseminated in scholarly and popular publications, exhibitions and a wide range of public programs. Aeronautics Division staff collect and study historic and technologically significant aircraft, as well as a myriad of related equipment and cultural memorabilia. These artifacts comprise both exhibition and study collections. Space History Department—The Space History Department is a focal point for the space-related collecting, historical research and exhibit work of the museum. Curators and historians within the department write, lecture, collect artifacts and prepare exhibitions in the following fields: rocketry, computers and avionics, human spaceflight, satellites and commercial spacecraft, military space, space science, ground- and space-based planetary science and astronomy, and foreign space programs. Center for Earth and Planetary Studies—Established in 1973, the Center for Earth and Planetary Studies uses a collection of more than 300,000 photographs and images of the Earth, moon and planets in research related to planetary and terrestrial geology—many obtained from Earth-orbiting satellites and manned and unmanned space missions. Staff research activities include planetary geology, geophysics and geologic mapping of planetary surfaces, geomorphology and surface dynamics in arid and semi-arid regions of the Earth and comparative studies of volcanic and tectonic landforms on the Earth and other terrestrial planets. Collections Department—The Collections Department of the National Air and Space Museum is located primarily at the Steven F. Udvar-Hazy Center. The division consists of the Collections Department Administrative Section, the Preservation and Restoration Unit, the Conservation Unit and the Office of the Registrar. The Collections Department is responsible for the protection, preservation, conservation and restoration of the National Collection of Aeronautics and Space Artifacts in perpetuity; it is responsible for guaranteeing physical care of the collections. 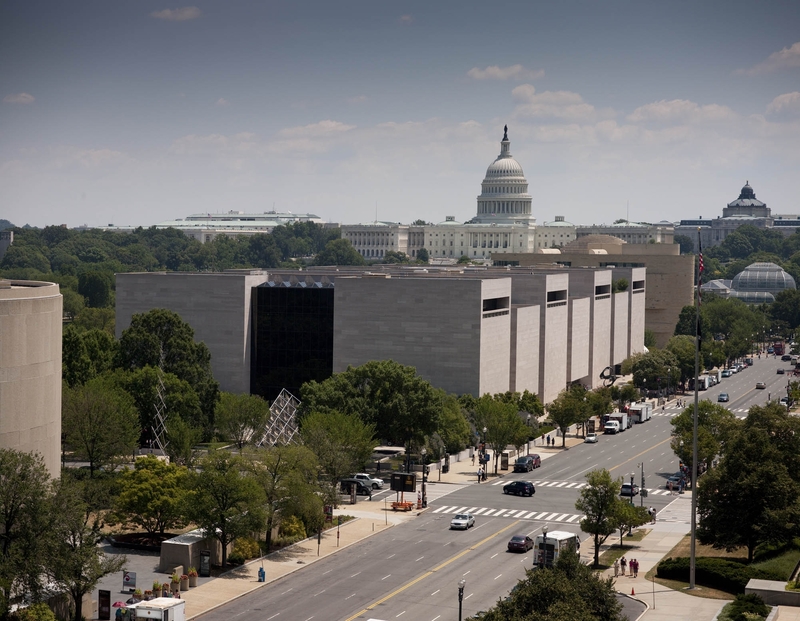 Archives—The Archives at the National Air and Space Museum is responsible for document, film and photograph collections relating to the history and technology of aviation and aerospace. The document collections include more than 2 million aircraft engineering drawings from the 1890s to the 1970s, either on microfilm or in paper format, and numerous technical manuals, manuscript collections and scrapbooks, as well as other photo collections. Written inquiries from the public are welcome. Researchers may visit the Archives to conduct their own research by appointment. “Boeing Milestones of Flight Hall”—The entrance gallery showcases the Spirit of St. Louis, the North American X-15A-1, John Glenn’s Mercury spacecraft, the Viking Lander, Pioneer 10, SpaceShipOne and a touchable lunar sample. “Early Flight”—This gallery resembles an indoor aeronautical exhibition from 1913 and covers the birth and early years of the air age. Planes on display include the 1909 Wright Military Flyer (world’s first military airplane), the Ecker Flying boat, a 1911 Curtiss Model D and an 1894 Lilienthal glider. “The Wright Brothers and The Invention of the Aerial Age”—The 1903 Wright Flyer serves as the centerpiece of this exhibition, which tells the story of how Wilbur and Orville Wright invented the airplane and how their monumental achievement affected the world in the decade that followed. The exhibition includes many historic photographs and cultural artifacts, along with instruments and personal items associated with the Wrights. “Golden Age of Flight”—This gallery presents the planes, personalities and aviation events that marked the years between the two world wars. Featured objects included a Wittman Buster, Beechcraft Staggerwing, Curtiss Robin Ole Miss, Hughes H-1 and Northrop Gamma Polar Star. “How Things Fly”—This interactive gallery allows children and adults to explore the principles of flight through hands-on activities. It features a Cessna 150, a section of a Boeing 757 fuselage, a model of the International Space Station and more than 50 interactives, including a visitor-operated supersonic wind tunnel. “Exploring the Planets”—This gallery takes visitors on a tour of the solar system and imparts some of the knowledge scientists have acquired by exploring the planets via space missions and observations from Earth. The largest single artifact in this gallery is a full-scale replica of a Voyager spacecraft. “Explore the Universe”—Five major sections trace 400 years of evolution in the instruments humankind has used to view the heavens and probe its secrets. The exhibition features William Herschel’s favorite telescope, an observing cage from Mount Wilson used by Edwin Hubble and the backup mirror for the Hubble Space Telescope. “World War II Aviation”—The air history of World War II is featured in this gallery. Artifacts include a Messerschmitt Bf 109, Supermarine Spitfire, Mitsubishi Zero, Macchi 202 and North American P-51 Mustang. “Space Race”—This exhibition chronicles human space exploration from the end of World War II to the present. It centers on the Cold War contest between the United States and the former Soviet Union and examines the spectacular public milestones and ultrasecret missions undertaken by these two great powers. Artifacts include the Kosmos 1442 Merkur spacecraft, a recreation of the Apollo-Soyuz rendezvous, the backup Skylab Orbital Workshop, Corona spy satellite and the Hubble Space Telescope test vehicle. “Apollo to the Moon”—This gallery tells the story of the U.S.-manned spaceflight programs from Project Mercury through Skylab. Artifacts include the Skylab 4 command module, Lunar Roving Vehicle, Gene Cernan’s Apollo 17 spacesuit and lunar surface experiments. Various types of lunar samples highlight the hall. “Barron Hilton Pioneers of Flight Gallery”—This gallery contains an impressive, eclectic assortment of aircraft and exhibits each representing an unprecedented feat, a barrier overcome or a pioneering step. Each exhibit and children’s activity showcases people who pushed the existing technological—or social—limits of flight. Aircraft in this gallery include the Douglas World Cruiser, Lindbergh’s Lockheed Sirius, Fokker T-2 and the Curtiss R3C-2. Also presented are Amelia Earhart’s Lockheed 5B Vega, a commemorative Lindbergh exhibit and an examination of the roles of African Americans in aviation. “America by Air”—Through a comprehensive array of artifacts, photographs, artwork and interactive displays, the gallery shows how paying passengers got off the ground after the development of airmail; how air travel went from the realm of intrepid adventurers to an everyday necessity; and how current events will affect the way people fly for years to come. Aircraft in the gallery include the first aircraft to fly the mail; a Ford Tri-Motor; a Douglas DC-7, the first airliner to provide nonstop coast-to-coast service; and the forward fuselage section of a Boeing 747 jumbo jet. “Time and Navigation”—This exhibition explores how revolutions in timekeeping over three centuries have influenced how we find our way. Artifacts on display include Wiley Post's Winnie Mae, which circled the globe two times; the flight qualified spare of the Mariner 10, a spacecraft that used a gravitational assist from Venus and then passed by Mercury three times; and “Stanley,” a 2005 Volkswagen Touareg modified to navigate without remote control and without a human driver in the seat. “Military Unmanned Aerial Vehicles (UAVs)”— This exhibit showcases six modern military UAVs that represent a variety of missions and technologies. They range from large vehicles that can carry offensive weapons to a miniature system whose components are light and compact enough to be carried in a Marine’s backpack. Unlike the Mall building, which features traditional exhibitions, the Steven F. Udvar-Hazy Center houses artifacts in an enhanced open-storage design filling two huge connecting structures: the Boeing Aviation Hangar and the James S. McDonnell Space Hangar. There are 2,700 aviation, 1,065 space, and 44 art objects on display. Attractions include the Donald D. Engen Observation Tower, the Airbus IMAX Theater and the Mary Baker Engen Restoration Hangar. 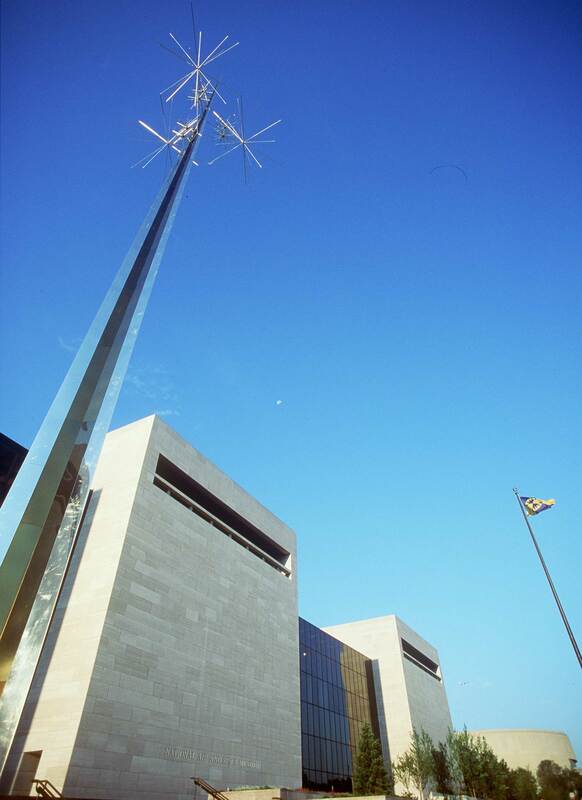 The National Air and Space Museum’s Mall building is located at Sixth Street and Independence Avenue S.W. The Steven F. Udvar-Hazy Center is located in Chantilly, Va., off of Route 28 near Washington Dulles International Airport. Both facilities are open from 10 a.m. to 5:30 p.m. (Closed Dec. 25.) Admission is free, but there is a $15 fee for parking at the Udvar-Hazy Center before 4 p.m. 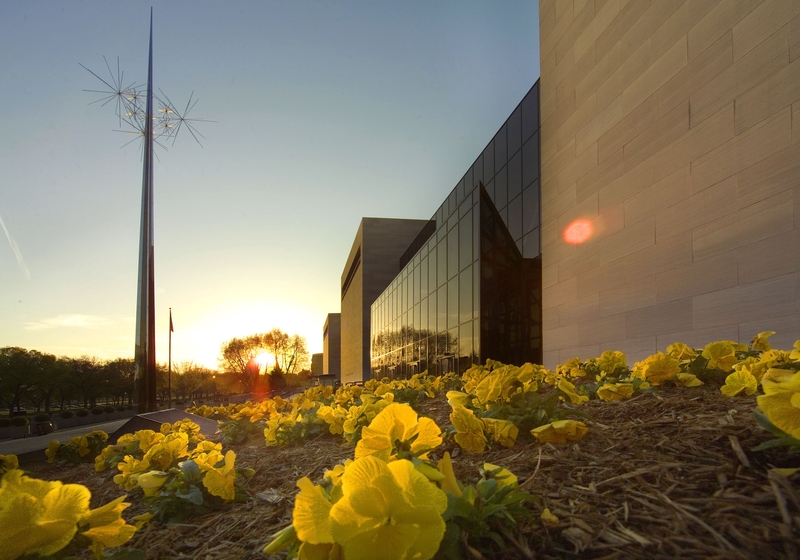 Both the museum in Washington and the Udvar-Hazy Center often observe extended hours during the spring and summer, check the website for details. The Smithsonian's National Air and Space Museum on the National Mall in Washington, D.C. has hundreds of original, historic artifacts on display, including the 1903 Wright Flyer; the Spirit of St. Louis; the Apollo 11 command module Columbia; and a Lunar rock sample that visitors can touch.